The Memphis Redbirds (4-7) scored in five-straight innings from the third-through-seventh Sunday afternoon in Round Rock, Texas, but the Round Rock Express (Astros) matched them and scored three runs of their own in the bottom of the sixth to secure a 7-6 win over the Redbirds. The win pushed the Cardinals win streak to four games after an 0-7 start to the season on the road. The 4-0 home start ties the 2010 Cardinals for the best start to a home schedule in organization history. The 2010 Cardinals finished the season 76-64 and lost in the Texas League Semi-Finals. - 2B Irving Lopez started this series with a walk-off home run and he ended it with one on Sunday. Lopez's two-run shot came with one out in the bottom of the 10th with RF Scott Hurst at second. - In the top of the 10th, Gonzalez kept the game tied 6-6 despite the Naturals placing runners on the corners with no outs. First, Gonzalez induced a Xavier Fernandez ground ball that ended with Meibrys Viloria being thrown out at third. That key play was followed by a shallow fly out to center and a strikeout to preserve the tie. - The Naturals tied the game with three runs in the eighth off Cardinals RHP Will Latcham. - RHP Anthony Shew went 5.0 full innings, striking out six for the second straight start and leaving the game in line for the win. - Lopez's walk-off homer was his second walk-off home run in the four-game series and his third homer of the season. 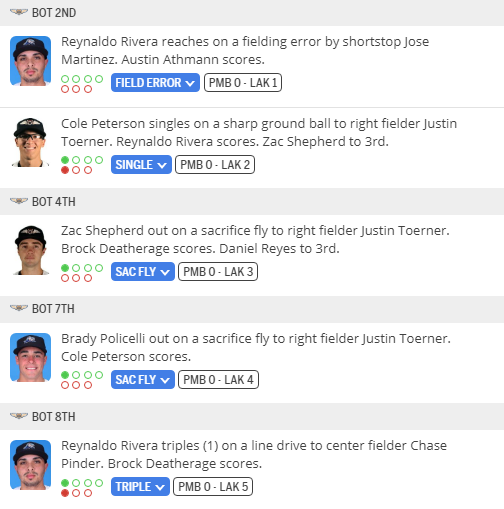 Lopez now has seven extra-base hits in just 34 Double-A at-bats. - Rehabbing St. Louis Cardinals RHP Luke Gregerson tossed a scoreless 6th inning, striking out two and extending his Springfield Cardinals scoreless innings streak to 21.0. - 1B Evan Mendoza extended his hit streak to six games with a 1-for-4 day, scoring twice. - The sweep is the first for the Cardinals at home over the Naturals since July 15-18, 2018. The Memphis Redbirds (5-7) scored in five runs in the second inning and four in the eighth, backing a quality start from Jake Woodford, to cap off their seven-game road trip with a 10-2 win over the Round Rock Express (Astros). Memphis had four hits and two walks in a five-run second chasing Round Rock starter Forrest Whitley, the No. 7 prospect in all of baseball, after just 1.1 innings pitched. John Nogowski started the inning with a double, Max Schrock walked, and Andrew Knizner drove them both in with a double. Following a walk from Ramon Urias, Edmundo Sosa and Tommy Edman hit back-to-back doubles to cap off the scoring in the frame. Nogowski reached safely in all five of his plate appearances, going 3-for-3 with two walks and Edman drove in a season-high four runs, extending his hitting streak to a team-high seven games, and collected his sixth multi-hit performance in 10 starts. Round Rock (7-5) struck first in the contest with a two-out solo home run from Jack Mayfield in the opening inning, but Woodford battled back, retiring seven of the next eight batters faced and picking off the lone baserunner that reached during that stretch. The 22-year-old delivered his first quality start of the season, pitching 6.1 innings and allowing two runs on five hits. Following Woodford's departure, the trio of Jesus Cruz, Hunter Cervenka and Chasen Shreve combined to not allow a hit in 2.2 innings of bullpen work, while striking out five and issuing two walks. Redbird bats came alive again in the eighth, with Urias and Rangel Ravelo launching solo shots and Edman slugging a two-run homer for his first of the year as the Redbirds reached double-digit runs for the first time this season. Seven Redbirds collected hits and reached safely in the contest, with four batters getting at least two hits. The 5-0 home start is a new organization record for the best start to a home schedule in Springfield's 15-year history, breaking 2010's 4-0 start. The 2010 Cardinals finished the season 76-64 and lost in the Texas League Semi-Finals. - 2B Irving Lopez's two-run homer in the third inning pulled the Cardinals within 3-2 and his second of the game in the fifth gave Springfield the lead for good at 5-3. - 1B Chris Chinea tied the game 3-3 with a solo shot to center in the fourth, fully erasing a 3-0 Cardinals deficit that came courtesy of a three-run second inning by Tulsa. - A two-out RBI single by C Jose Godoy proved the difference. That hit scored Evan Mendoza and put the Cardinals ahead 6-4 in the eighth. Gavin Lux then led off the top of the ninth with a solo home run to pull the Drillers within 6-5 before Seth Elledge nailed down the final three outs for the save. - The two home runs by Lopez gives the second baseman five dingers in his last six games and four in the first five games of the Cardinals homestand. - 3B Evan Mendoza's six-game hit streak ended with an 0-for-3 night. - The save by Elledge was the first successful save attempt by Cardinals relievers this season. The Peoria Chiefs pitching staff notched a season-high 15 strikeouts, but fell to the Clinton LumberKings 8-7 in game one of the three-game set. The Chiefs are now 4-7 on the season with two games left in this homestand. The LumberKings jumped on the Chiefs early in the top of the first against Peoria starter Dionis Zamora. Jerar Encarnacion launched a two-run homerun to put Clinton ahead 2-0, but Zamora bounced back with two strikeouts to end the first. The LumberKings kept their momentum going, scoring one in the top of the second. Bubba Hollins led off with a single and advanced to second on a wild pitch. With two outs Thomas Jones singled to left field, scoring Hollins from second to push the Clinton lead to 3-0. Peoria wasn't down for long, as they put a four-spot on the board to take the lead for the first time in bottom of the second. Leandro Cedeno and Lars Nootbaar started the inning with back-to-back singles, then Ivan Herrera reached first on a fielding error by Clinton shortstop Christopher Torres. Delvin Perez singled with the bases loaded to score Cedeno from third to make the score 3-1. After a strikeout of Wadye Ynfante, Brandon Riley cleared the bases with a double to centerfield to give Peoria a 4-3 lead. Clinton responded with five runs to regain the lead in the top of the third and knocked Zamora out of the game. Torres drew a leadoff walk and Encarnacion drove him in with a double down the left field line to tie the game at four. Zamora notched his sixth strikeout but then surrendered four straight hits to push Clinton's lead to 7-4. With two outs, Thomas Jones singled to score Demetrius Sims to make the score 8-4 and Zamora's day ended there. Edgar Escobar entered the game for Zamora, after allowing a single to the first hitter he saw, he got out of the inning with a line drive to Perez. Peoria did not go away, as they scored one run in the bottom of the fourth. Ivan Herrera hit his second double of the season with one out. Two batters later, Ynfante singled to put runners on the corners with two outs and Riley singled to score Herrera to make the score 8-5. The Chiefs kept the momentum going, scoring two more in the bottom of the sixth to pull to within one, 8-7. Herrera drew a leadoff walk and with one out, Ynfante launched his first homerun of the season, a two-run homerun to left field to make the score 8-7. Zamora (0-2) took his second loss of the season, throwing 2 2/3, notching six strikeouts, but he allowed eight hits, and a career high eight runs. Edgar Escobar threw 2 1/3 innings, allowing only three hits, and tallied four strikeouts. Freddy Pacheco also threw 2 1/3 innings, surrendering only one hit, while striking out four. Fabian Blanco, the final pitcher for Peoria, threw 1 2/3 innings, allowing one hit and notching one strikeout. A three-run home run by Adolis Garcia and a grand slam by Johan Mieses powered the Memphis Redbirds (6-7) to an 8-7 win over the San Antonio Missions (Brewers) in the series opener Tuesday night at AutoZone Park. Also on the offensive side for the Redbirds, Tommy Edman was 1-for-4, extending his hitting streak to eight games. Andrew Knizner was on base four times with three singles and a walk, as was Max Schrock with two singles and two free passes. John Nogowski drove in Memphis' other run with a sixth-inning single. 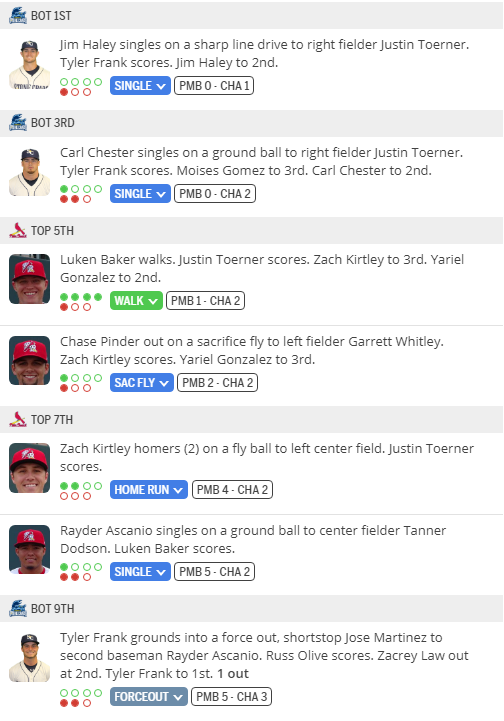 The game began in auspicious fashion for Memphis, as the Redbirds had runners on base in each of the first four innings but grounded into four inning-ending double plays. During that time, San Antonio (7-6) hit three solo home runs off Memphis starter Genesis Cabrera to open a 3-0 lead after four frames. The score remained 3-0 until the bottom of the sixth, when Nogowski got the Redbirds on the board ahead of Garcia's three-run home run to deep left field, his third of the season. The Redbirds added to their lead when Mieses, just recalled from Double-A Springfield, hit a grand slam in the bottom of the eighth, and the score shot to 8-3 in favor of Memphis. But the Missions did not go quietly in the top of the ninth, scoring four times and having the potential tying run on second base, before a groundout induced by John Fasola ended the ballgame. Cabrera struck out five in 3.2 innings of work, and Tommy Layne followed with 2.1 innings of scoreless relief with one hit allowed to earn the win. Hunter Cervenka pitched a scoreless seventh and Jesus Cruz tossed a scoreless eighth for the Redbirds to follow suit. Chasen Shreve surrendered four runs, three earned, in the ninth, before Fasola entered and finished the ballgame. - The Drillers put the Cardinals away thanks to two big innings: a four-run second and a five-run fourth. - Tulsa's four runs in the second inning came off a Logan Landon sacrifice fly and a pair of singles by May and Cristian Santana. - A two-run DJ Peters double and a two-run Zach Reks home run in the fourth inning put Springfield in a 9-0 hole. - May allowed just three hits and two walks to five strikeouts over 5.0 innings, shutting down Springfield before handing the game over to his bullpen (4.0 IP, 0 R, 3 K). Leandro Cedeno gave the Peoria Chiefs their first walk off win of the season as he singled home Lars Nootbaar with the bases loaded and two outs in the ninth for a 2-1 win over the Clinton LumberKings Tuesday night. The Chiefs improve to 5-7 and look to take the series finale Wednesday at 12:05 p.m.
For the second night in a row, the LumberKings jumped out to an early lead. With two outs in the top of the second, Bubba Hollins hit a solo home run off Chiefs starter Tommy Parsons, which was the first run Parsons surrendered in his 14 2/3 innings pitched this season. Peoria broke through against Chris Vallimont in the bottom of the fifth. Cedeno tied the game at one when he blasted his first homerun of the season to right field to lead off the inning. The Chiefs walked off in the ninth after loading the bases with two outs, Nootbaar and Brandon Riley started the inning with a pair of singles to put runners on first and second with no outs. After two strikeouts, Brendan Donovan walked to load the bases, and Cedeno hit a hard line drive over the shortstop's head to score Nootbaar from third and give the Chiefs their first walkoff win of the season. Parsons took the no decision as he pitched eight strong innings, with a career-high eight strikeouts, while allowing only one run on four hits. Sebastian Tabata (1-0) entered in the ninth and pitched a perfect inning, while notching one strikeout. It helps me keep track of how our players are doing in the system too; which I have become a lot more interested in over the last few seasons. The Memphis Redbirds (7-7) picked up their third-straight win and fourth in the last five contests overall Wednesday night at AutoZone Park, scoring two runs in three separate innings en route to a 7-6 victory over the San Antonio Missions (Brewers). Tommy Edman was 3-for-5 with a double and two runs scored, extending his hitting streak to nine games. He now has seven multi-hit games in 12 starts this season. Edmundo Sosa also had three hits, and Max Schrock was 2-for-5 with two RBI and a run. Drew Robinson was on base five times with a single, three walks, and a hit by pitch. Daniel Ponce de Leon threw 6.0 innings and picked up his second win of the season, striking out eight and walking one. Ryan Meisinger pitched 2.0 scoreless, hitless innings of relief, and John Fasola earned his second save in two days by finishing out the ninth inning. 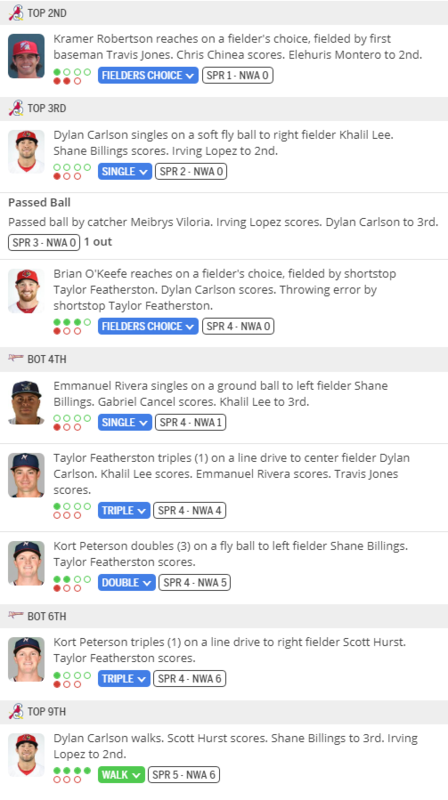 San Antonio (7-7) scored twice in the ninth, coming off a wild pitch and a Mauricio Dubon home run, but Fasola got an easy groundout to finish the ballgame. Memphis led 3-0 after three innings, before San Antonio tied it up in the top of the fourth. But the Redbirds answered right back in the home-half with John Nogowski hitting a two-run home run, his second of the season, to make the score 5-3. San Antonio again got within a run on another home run in the top of the sixth, before the Redbirds got some breathing room on Schrock's two-run single in the bottom of the seventh. In addition to being on base five times, Robinson stole his second base of the season, as did Schrock. - The Drillers took the lead for good on a Cody Thomas solo home run in the top of the fourth that came just over an inning after the Cardinals battled back from a 3-0 deficit to briefly tie the game 3-3 in the bottom of the second. - Tulsa scored at least a run in six of the game's first seven innings. - A three-run home run by Cody Thomas pushed Tulsa's 7-3 lead to 10-3 in the seventh. Those three runs proved to be the difference after a four-run Cardinals rally in the eighth cemented the 10-7 final score. - Thomas finished 4-for-4 with three home runs and five RBIs out of the eight-spot in the Drillers lineup. - Cardinals RF Shane Billings connected on his first home run of the season in his first game of 2019. Billings finished 2-for-3 with three RBIs. - CF Scott Hurst powered his first career Double-A homer to center in the second, a two-run shot that scored Elehuris Montero and tied the game 3-3. Despite two homeruns and a solid start from Alvaro Seijas, Peoria lost the series finale 8-4 to the LumberKings on Wednesday afternoon. The Chiefs fall to 5-8 as they begin a three-game road trip to Burlington on Thursday. The LumberKings got on the board first, in the top of the second against Seijas. Bubba Hollins led off with a double and Marcos Rivera doubled in to put the LumberKings up 1-0. The Chiefs answered back with a run in the bottom of the second against Humberto Mejia to tie the game at one. Brady Whalen led off with a single, and with one out, Ivan Herrera singled to put runners on first and second. Josh Shaw singled up the middle and Whalen scored from second to tie the game at one. Peoria continued their momentum as they took the lead in the bottom of the third. Lars Nootbaar led off with a triple, and with one out, Nolan Gorman singled to put the Chiefs ahead 2-1. The lead continued to grow for the Chiefs in the bottom of the fourth. Herrera led off the inning with a solo homerun, his third of the season, to build the Chiefs lead 3-1. Clinton exploded in the top of the seventh, putting a five-spot on the board. 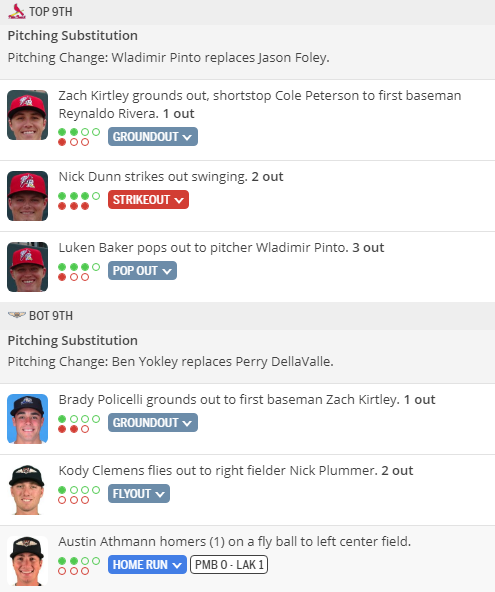 Jacob Schlesener entered the game for Peoria and issued three walks to start the seventh. With the bases loaded, Ricardo Cespedes walked to bring in the first run to make the score 3-2. Noel De Jesus replaced Schlesener and Brayan Hernandez hit a sac fly to score Rivera from third to tie the game at three. With one out, Jerar Encarnacion blasted a three-run homerun to push the lead to 6-3 for Clinton. Peoria answered right back in the bottom of the seventh with a run of their own. With two outs, Nootbaar hit his fourth homerun of the season to make the score 6-4, which tied Gorman for the team lead in homeruns. The LumberKings continued to build their lead, putting up two more runs in the eighth. Hollins started the inning with a solo homerun of De Jesus to make the lead 7-4 for the LumberKings and Rivera followed up with a single, then advanced to second on a wild pitch. Evan Sisk entered the game for Peoria and struck out the next two batters. With two outs, Rivera scored on an error for an 8-4 lead. Seijas took the no decision as he pitched six innings, tied a career-high with nine strikeouts, while allowing only one run on four hits. Schlesener (0-3) took the loss as he did not record an out, he walked four and surrendered four runs. De Jesus finished with one inning, while allowing three hits, two runs, with one walk and one strikeout. Sisk finished with two innings pitched, with one hit and three strikeouts. The 2016 sixth-rounder's three-hit performance from the leadoff spot was his third during his current nine-game hitting streak, and he now has seven multihit efforts under his belt through 12 games for the Redbirds. Overall, Edman owns a .370/.407/.556 line with seven extra-base hits, 12 runs and 10 RBIs through 54 at-bats. Edman has looked impressive. Hopefully he continues to rake all the way to St. Louis in a couple years. Thursday's game between the Memphis Redbirds and San Antonio Missions has been postponed due to inclement weather. It will be made up as part of a doubleheader on Monday, May 27, when San Antonio next plays a series in Memphis. After getting blanked by 2018 first overall pick Casey Mize and the Lakeland Flying Tigers on Wednesday night, the Cardinals returned home on Thursday and rebounded with an eight run, 13 hit performance in a series opening victory against the Mets. 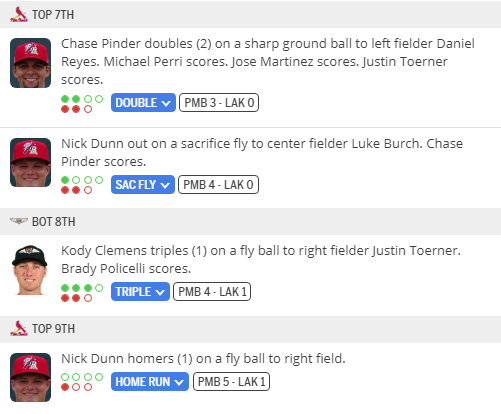 Palm Beach got on the board first in the bottom of the third after Luken Baker's two-out RBI single brought home Justin Toener. The Cardinals extended their lead in the very next inning when Justin Toerner smacked a two-out, two-RBI double to right making it a 3-0 ball game. Palm Beach relished its opportunities all night scoring four of its eight total runs with two outs. After throwing four no-hit innings to begin his outing, Beach Birds' starter Angel Rondon gave up a walk and a single to begin the fifth before allowing a three-run homer to tie up the game. That was the 21-year-old's only blemish as he finished the night with 5 2/3 innings thrown while allowing two hits, three earned runs, and striking out nine. The Cardinals took no time reclaiming the lead posting four runs in the home half of the fifth. Luken Baker opened up the frame with his second of three hits on the night. Yariel Gonzalez's double put runners on second and third with no outs when Chase Pinder hit an RBI single to left, leaving runners on the corner. Next up was Julio Rodriguez who brought everyone including himself home with a three-run homer, his first of the season. The bullpen would shut the Mets down for the rest of the night. Bryan Dobzanski threw 1 1/3 scoreless innings follow by Ronnie Williams who allowed just a solo run in 2/3 of an inning. C.J. Saylor closed out the game with 1 1/3 shutout innings of his own. Palm Beach scored one final run in the sixth after Zach Kirtley scored from third on a wild pitch. A bizarre game that included the Peoria Chiefs taking a no-hitter into the eighth inning despite walking five batters in the first inning, ended on a bases loaded sacrifice fly as the Burlington Bees walked-off with a 4-3 Thursday night win. The loss drops the Chiefs to 5-9 on the season with game two of the series set for Friday. The Chiefs jumped out to an early lead against Jake Lee in the top of the first inning. Lars Nootbaar led off with a double to left-center and moved to third on a groundout. Nolan Gorman singled through the shift for his 15th RBI of the season to put the visitors on top 1-0. Brady Whalen's single put runners on the corners and Brendan Donovan gave the Chiefs a 2-0 lead with a sacrifice fly. Burlington scored in the bottom of the inning without getting a hit against Cole Aker. After a strikeout, Aker walked five straight Bees batters and benefitted from Kevin Maitan running into an out at the plate on a pitch in the dirt. With two outs and the bases loaded, Edgar Escobar came out of the bullpen and got a strikeout to end the frame with the Chiefs up 2-1. The game stayed 2-1 until the eighth. Escobar walked one and gave way to Freddy Pacheco who struck out seven of the nine batters he faced. Thomas St. Clair issued a walk but got out of the seventh with the no-hitter intact. Jordyn Adams walked to start the eighth and Livan Soto blooped a double down the left-field line to break up the no-no. With one out Fabian Blanco took over on the mound and the Bees took a 3-2 lead with three straight singles. Down a run the Chiefs tied the game in the ninth against Chris Molina and Tyler Smith. Leandro Cedeno doubled off Molina to start the inning and with one out Smith came in to face Delvin Perez. Perez reached on a bunt single and pinch-runner Edwin Figuera moved up to third. Figurea scored to tie the game on a wild pitch as Perez took second. Perez stole third but Smith retired Nootbaar to end the inning. Burlington won the game in the bottom of the ninth as they loaded the bases against Blanco with a single and two walks. With one out, Maitan delivered a sacrifice fly to center for the 4-3 win. Aker walked five and allowed one run while striking out one in 2/3 of an inning. Escobar allowed one walk and struck out four over three hitless innings. Pacheco threw three perfect innings while striking out seven. St. Clair allowed two runs on one hit and two walks while striking out one over 2/3 of an inning. Blanco (0-1) took the loss as he allowed one run on four hits and two walks while striking out two over 1 1/3 innings.